The large, colorful landscapes of Mark Bowles and the stone, steel and wood sculptures of Fred Borcherdt may seem to be an odd coupling. A joint exhibition of their work at Mark Sublette Medicine Man Gallery in Tucson, Arizona is an opportunity to enjoy not only their work but to contemplate time. Mark Bowles, Changing Moments, acrylic on canvas, 60"x 60"
Bowles' Changing Moments brings the element of time into a static landscape. Traveling between his studios in Northern California ad in the Southern California desert, Bowles experiences the differences in color and light and the geological differences between the two. 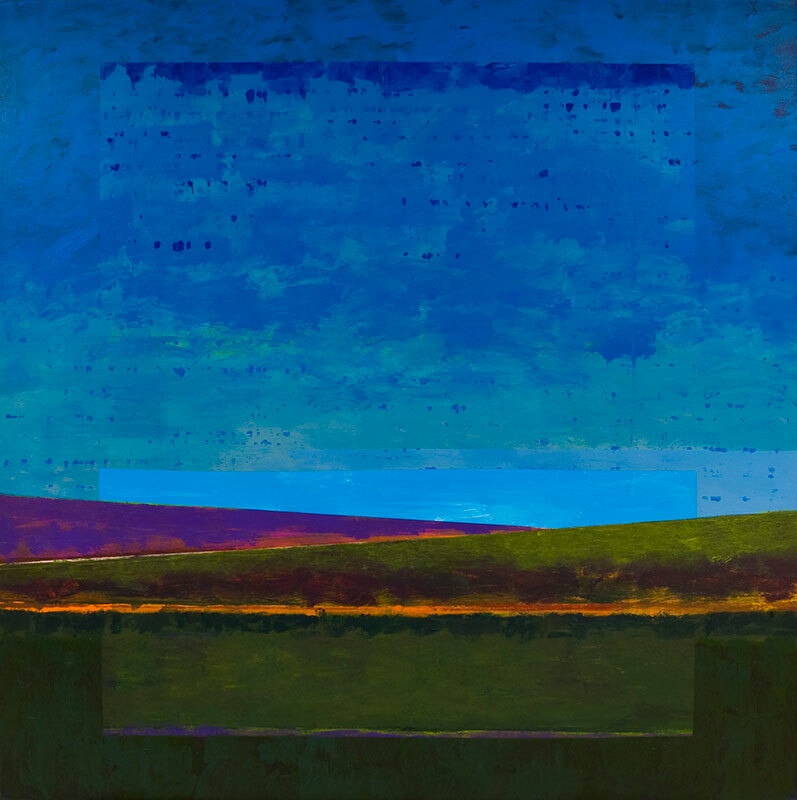 In the studio he is able to address his experience in composition, line and color. In Changing Moments the change in the landscape from one moment to the next is expressed through color and form in a subtle painting within a painting. In the '70s, Bowles painted more representational landscapes and then grew into monumental abstractions. As his paintings begin to contain more recognizable elements, color, size and impact remain. His admiration for Paul Cezanne is leading him to explore color even more. "The great thing about being an artist," he says, "is you never quit learning." 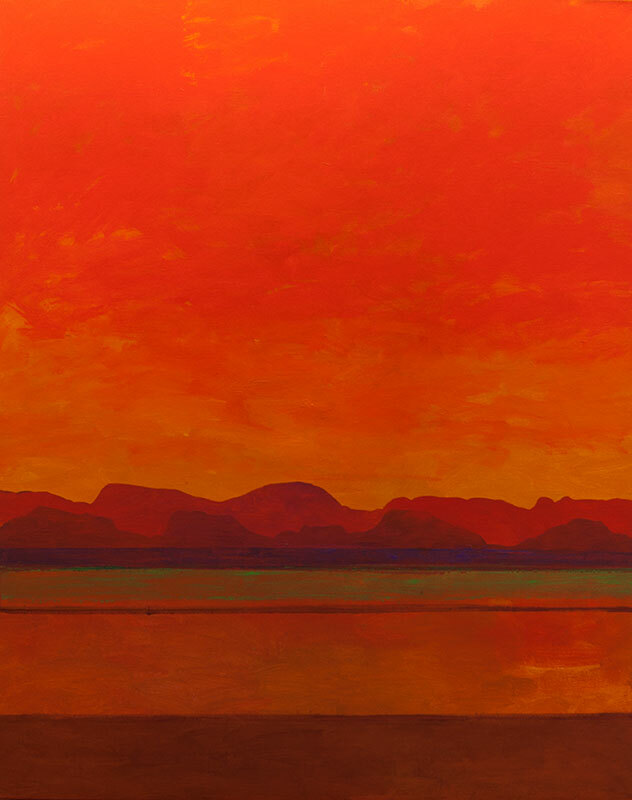 Mark Bowles, Indian Summer, acrylic on canvas, 50" x 40"
Borcherdt bought a bulldozer and buit a road to the side of his home near Tucson and learned all he needed to learn about stone. He takes material from the beginning of time and uses ancient techniques such as cutting stone and forging steelto make contemporary objects which, themselves, seem timeless. 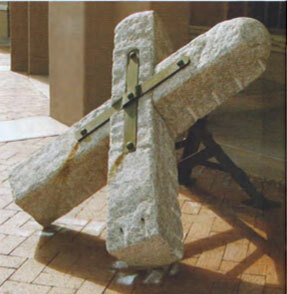 Fred Borcherdt, Passage Marker II, stone and forged steel, 23" x 103" x 13"
The works from his Markers series sugest mankind's placing of markers in the landscape. Passage Marker II seems simple enough from a distance with two stones markng a passageway and a rope delineating the boundary. The "rope" is made of forged steel and suggests a more permanent boundary. Terminal Marker has an "X marks the spot" quality. Even in its solidity, the passage of time is evident as the steel beigs to rust and to stain the stone. Fred Borcherdt, Terminal Marker, stone and forged steel, 42" x 51" x 40"
Another suggestion of time wll occur at the opening of the exhibition when Borcherdt will be avalable to sign copies of the book Fred Borcherdt: 50 Years of Sculpture.